It took about three and a half hours of driving on the motorway to travel from the Somme to Verdun. 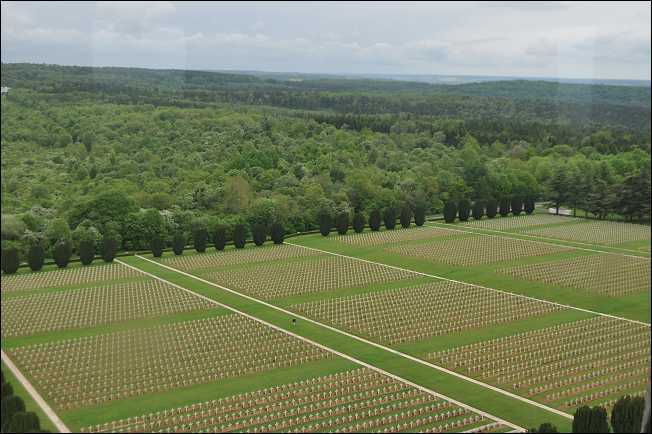 This gives some idea of the scale of the trench system on the Western Front. Having travelled from Ieper to the Somme then Verdun, I had still only travelled around half of the distance of the Front Line. The hills north of Verdun were the site of the defining battle of WW1 between Germany and France which lasted from 21 February 1916 until 19 December 1916. It caused almost a million casualties (dead, wounded and missing) in the two armies, within an area of less than ten square kilometres. The Battle of the Somme was partly instigated to relieve the French at this battle. It is a reminder that WW1 was not just a British war. After the War, the area was considered too dangerous for people to return, so apart from being planted with forest, the battle site was left as it was. One can still see the churned up ground and old trench lines between the trees wherever one goes. I visited: the Douaumont Ossuary where the bones of around 150,000 soldiers collected from the battlefield can be seen; Fort Douaumont where visitors can walk into the labyrinth of its clammy chambers; and the site of Douaumont village which was reduced to powdered brick dust by constant shelling.